By now you’ve no doubt heard all about the fall of Tuesday’s Proposal 1 vote. 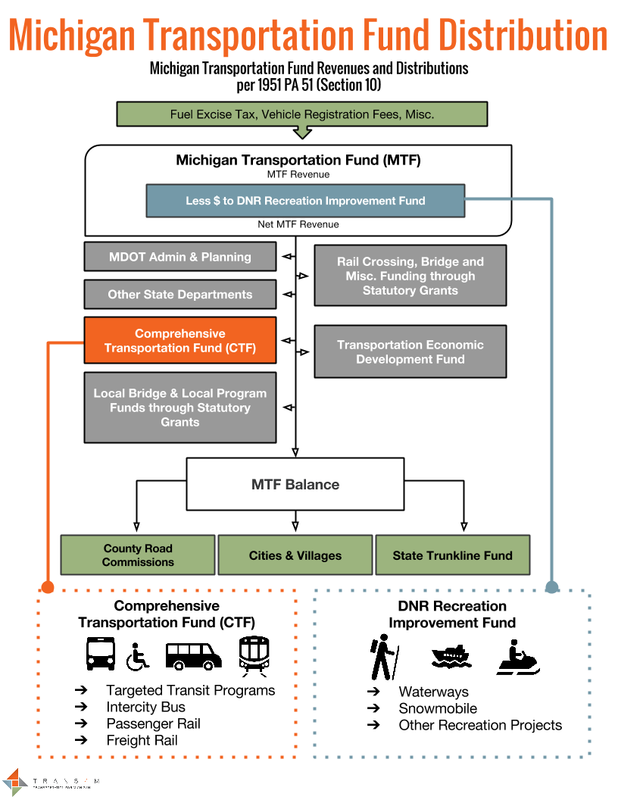 The proposed change to funding Michigan’s transportation system lost with a dramatic 4-1 ratio. Throughout the state voters expressed anger over Proposal 1, from frustration over the complexity of the attached 10 bills, to hostility towards the Legislature for not resolving the need for additional transportation funding on their own. Whomever you spoke to, the major takeaway remained the same: It’s now time for our elected officials to step up and find money for our ailing transportation system. 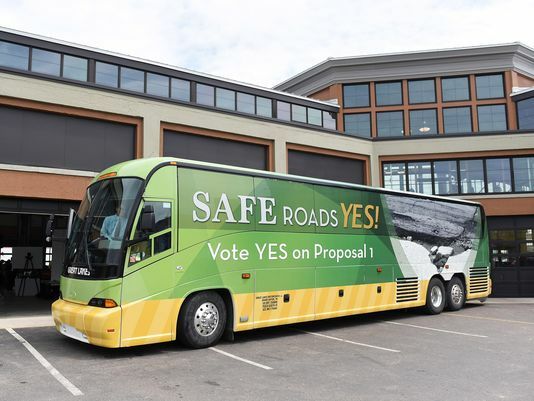 The Safe Roads Yes bus campaigns across Michigan in advance of the May 5 vote. Though this message is clear, the next steps are a little murkier. legislators have begun on Plan B, but there is no consensus on what that will look like. While some, like Speaker of the House Kevin Cotter (R-Mt. Pleasant) propose diverting funds from other sources to come up with the estimated $1.2 billion needed, others such as Reps. Todd Courser (R-Lapeer) and Cindy Gamrat (R-Plainwell) propose cuts as high as 10% to all state spending with savings funneled into the transportation fund. Concerns around these types of proposals center on the already tight state budget. According to the Citizens Research Council, of the approximately $52 billion spent by the state annually, only 8% (4.3 billion) is actually discretionary and available to be spent on emerging issues, such as transportation. The Senate Fiscal Agency estimates that this year the state will raise approximately $9.6 billion for the General Fund, the fund that has previously been tapped for transportation dollars and continues to be the target of proposed redistribution of existing funds. The majority of General Fund expenditures currently go to Medicaid, Human Services, Education, and Corrections with a small percentage being used in recent years to help match federal funds for transportation projects. To continue to divert money from this fund “means robbing Peter to pay Paul,” says Craig Thiel of the Citizens Research Council. Michigan citizens don’t want to see cuts to these services either. A statewide poll conducted by EPIC-MRA immediately before the election found strong opposition to cuts in major services in order to pay for road repairs: 88% oppose cuts to K-12 education, 86% oppose cuts to healthcare/Medicaid and 76% oppose cuts to local government budgets. The Legislature then faces the dilemma of how to secure new funds for transportation that doesn’t bleed these other services. Two proposals that would raise the gasoline tax emerged during the 2014 legislative session by both the House and Senate, but could not be sold in the chambers of their legislative counterparts. As legislators brainstorm around next steps, they may return to both of these plans as a starting point. The House (aka the ‘Bolger Plan’) and the Senate each took a very different approach to several issues that will need to be reconsidered, including: how much total money to raise for transportation, the balance between creating new revenue by increasing the fuel tax and redirecting existing revenue, and how quickly to phase in the changes. The Citizens Research Council illustrates how much money each of these original proposals would have brought in for transportation and the timeline for full implementation. 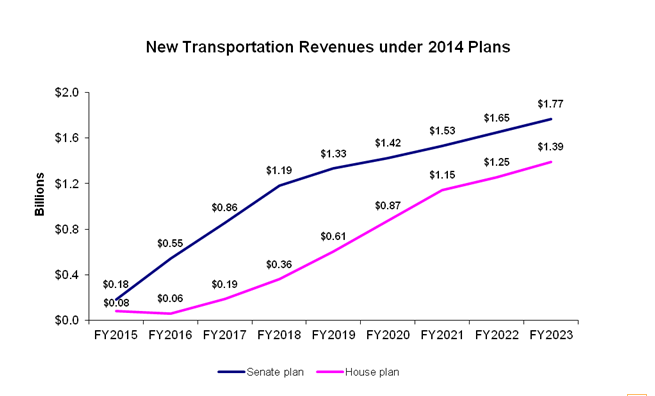 If the Legislature returns to either of these plans now, Michigan would potentially not see a significant increase in transportation funding for several years, especially since implementation would now begin later in 2015 or perhaps later. This, of course, assumes that the Legislature would even reconsider raising taxes for an increase in state transportation funding, which many legislators have already come out solidly against including Democrats fearing for a regressive tax against low income households. Despite the results at the ballot, Michiganders polled in the April EPIC-MRA poll favored (67%) a 1 cent increase in sales tax, as long as all of that revenue went to transportation. In lieu of any solid state wide solution, local solutions are finding support. On May 5, local millages in multiple communities in western Michigan passed to provide funding for road repairs, including a 2 mill increase in East Grand Rapids for local road and sidewalk repairs, a renewal of a 5 mill in Salem Township, 3 mill in Albion city and 1 mill in Hamilton township for local roads. Regional solutions are also being explored to attempt to bring in additional funds to repair roads. For many Trans4M member groups, one pivotal question will reemerge as the state considers a replacement for Proposal 1: Will any new revenue for transportation be distributed to the full system, including transit, rail, and nonmotorized options? 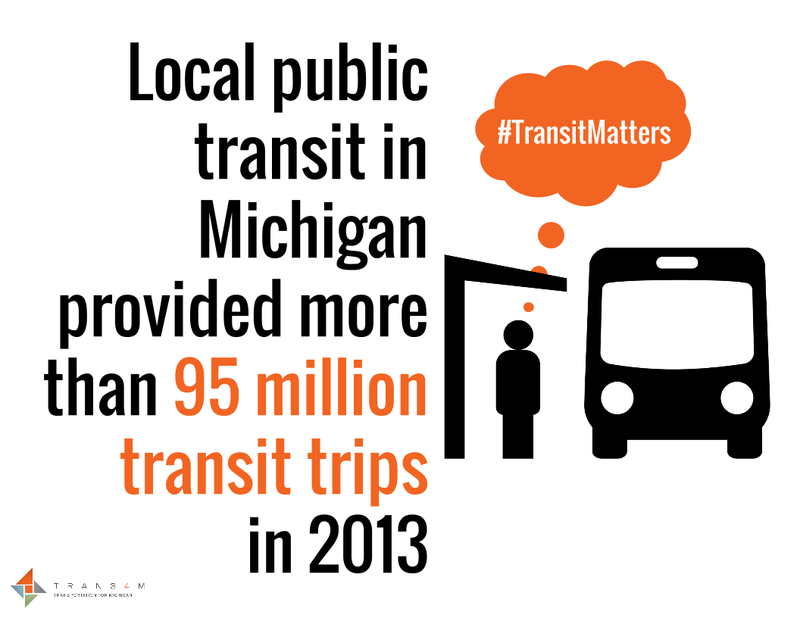 Fortunately, support for all transportation options continues to be found in the actions and voices of many Michigan residents. “In the wake of a historic loss, people were NOT saying no to transit” says Dusty Fancher of Midwest Strategy Group. She points to the passing of all three transit millages on Tuesday’s ballot, including the ITC (Iosco Transit Corporation) millage renewal (passed by 62%), the North Oakland new millage (passed by 18 votes) and the Van Buren County millage (passed by 56%). The fight for transportation funding continues. Though many advocates are encouraging the Legislature to remain in Lansing this summer until a solution is passed, it is unclear whether they will do so or break for summer in mid-June as planned. In the meantime, Trans4M member groups will continue to speak to our elected officials about the value of our complete transportation system and the dire need to increase state funding to support our failing infrastructure.